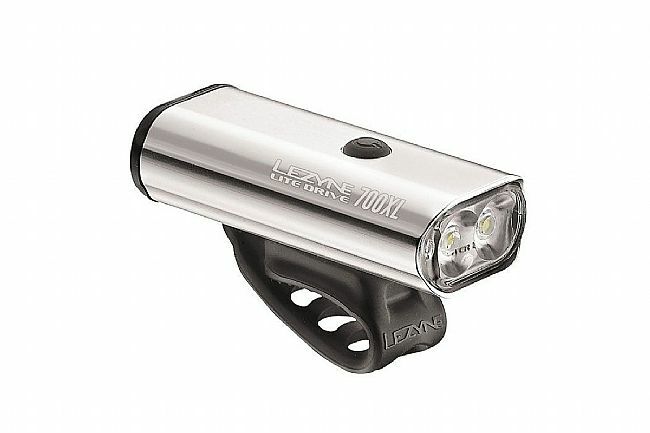 Lezyne’s Lite Drive 700XL is small, durable, and made of heat mitigating machined aluminum. 8 modes of illumination spanning 15 to 700 lumens provide the versatility needed to adapt to nearly any kind of low light environment. An enhanced MOR lens emits focused illumination directly onto the ground ahead while side lighting makes the rider more visible to those around them. The high-speed 2 amp USB charger comes with a wall adapter and provides a full charge within 6 hours. The included mounting strap is compatible with all standard handlebar types including aero bars. USB charger and wall adapter. Blast: 400 lumens, 3hrs run time. Enduro: 250 lumens, 5hrs 15mins run time. Economy: 150 lumens, 9hrs run time. Femto: 15 lumens, 76hrs run time. Day flash: 700 lumens, 8hrs 45mins run time. Flash: 150 lumens, 14hrs 30mins run time. Pulse: 150 lumens, 14hrs 30mins run time. Overdrive: 700 lumens, 1hr 30mins run time. Lezyne products are always well made, sturdy, and built to last. This light is no exception. Though I do wish I were a bit brighter than it is, it's still a great light. I thought 700 lumens would be enough for me, but turns out, I probably needed 1000. That's my fault, not Lezyne's. It's a great light, offered in great colors, too! Someoen said the light was heavy. True. But I don't really don't care about weight when visibility and reliability are at stake. This light stays on my spare out of town bike. It doesn't get much use. It's held it charge well. I feel seen when using it. I don't need it to see where I'm going. Would prefer a different base, it detracts from the overall look of the light. Quality light with strong and simple connection to handlebars. I was initially concerned that the rubber strap was too short to close around my handlebars (which are standard drop bar sizethickness) but it seems to have loosened slightly over time. This light would not work on a thicker bar. Lots of illumination mode options available. My only criticism is the charging port is recessed deep in the housing, making it more difficult than other lights I've used to connect for battery charging. This has numerous settings and is very well made. It gives off plenty of light and is a great safety feature for any bike. Nice USB chargeable light. Good side view and excellent mode options. Hold the power for 10 seconds, when the light is off, to go into race mode. This is very nice for night rides going in and out of low light areas. It stays on medium light, click once and it's full beam, click again and your back to medium. Race mode rules, and it always remembers what mode you were last in. Wow! A lot of options! Just started getting to figure out the best light option (is 8 too many) when it was stolen within a week. Love the looks but charging was difficult compared to other brands as the charger was recessed in the light. Might give it a try again.